D.J. Craik and R.T.C. Brownlee, Graphics-Aided NMR. D.B. Chesnut, Some Recent Ab Initio Calculations of the NMR Chemical Shift. B.P. Hills and P.S. Belton, NMR Studies of Membrane Transport. D.L. Turner, Recent Developments in Multiple Pulse NMR. H. Sait*aco and I. Ando, High Resolution Solid State NMR Studies of Synthetic and Biological Macromolecules. Each chapter includes references. Index. Commencing with Volume 21, the aim of this series is to produce a larger number of, relatively short but, timely and authoritative reviews. These will concentrate, in particular, on areas of NMR where recent progress, and developments, are of special interest and will reflect the many NMR developments occurring in the primary scientific literature. 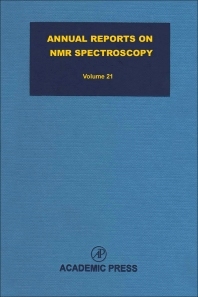 The present volume demonstrates the advances which can be made by the application of NMR techniques in many diverse areas of chemistry. Of particular significance is the account of Graphics-Aided NMR which will become an inprotant development in the use of NMR spectroscopy. NMR spectroscopists, theoretical and physical chemists, membrane/polymer scientists. Editor of about 150 volumes, mostly dealing with aspects of NMR. Retired Professor of Chemistry from the University of Surrey.